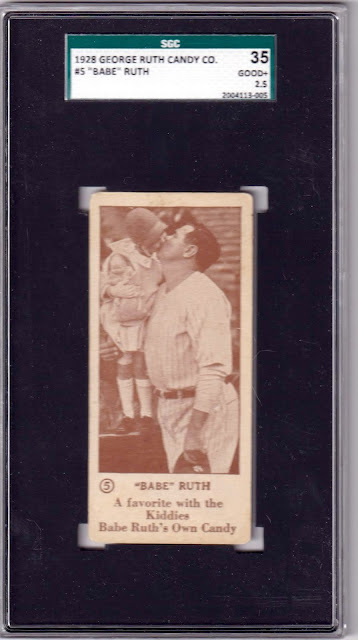 Today's Babe Ruth Candy set reminded me of a trivia question: who hit more homers for the Boston Braves, Babe Ruth or Hank Aaron? It's sort of a trick, because while both sluggers played for Boston or the Braves, they spent very little time in Boston for the Braves. Hank Aaron debuted for the Braves in 1954, two years after their move to Milwaukee, so hit zero for Boston's squad. Ruth famously debuted in Boston for the Red Sox, but only played a single, final year for their Braves team. 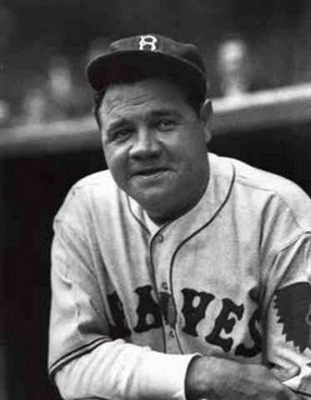 The Bambino slugged his last 6 homers wearing a Boston Braves uniform, career #s 709 to 714. Thus, your answer is Babe's six over Hank's zero. 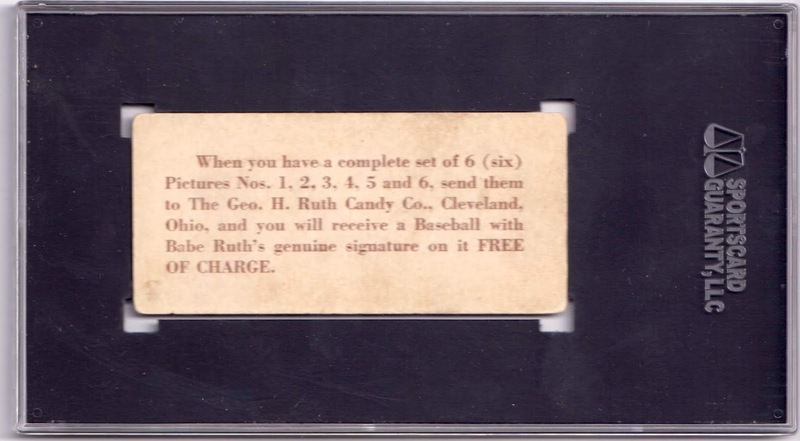 Enough esoterica, let's see some Ruthian cards, as packaged with his eponymous (and short-lived) candy bar in 1928. I believe that's Babe's daughter, helping dad with a pregame photo op. Not your typical baseball card by a long shot. 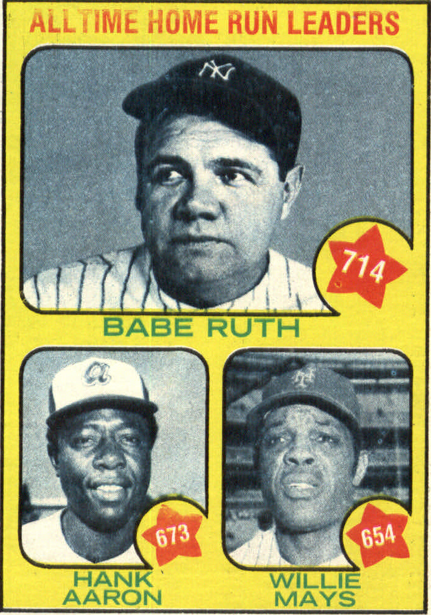 Others in the set show Ruth warming up on the field or in casual settings, one even in suit-and-tie, purportedly eating his Home Run candy bar under the tagline, "His candy helped him." You can find three backs: no text, this Cleveland address, and one in San Francisco. As the text implies, today's brief 6-picture set came packaged with pieces of Ruth-endorsed candy. But was it the Baby Ruth bar? It was not. The Curtiss Candy Company debuted their peanut-and-chocolate Baby Ruth in 1921, one year after Ruth's popular ascendance, yet steadfastly maintained it honored the daughter of president Grover Cleveland, whose mid-administration birth made headlines...in the 19th century. It's easy to see how Snopes debunked Ruth Cleveland as a defensible origin story, but at the time, Curtiss successfully blocked sale of Babe Ruth's Home Run bar due to potential name confusion. Are there Ruth shenanigans more shenanigan-y than this? None come to mind. 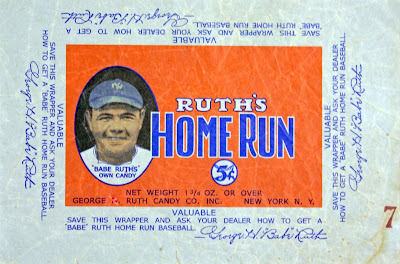 If Baby Ruth wanted people to believe they didn't rip off Babe Ruth, why advertise baseball gloves on your wrapper? Another point against them acting in anything like good faith. 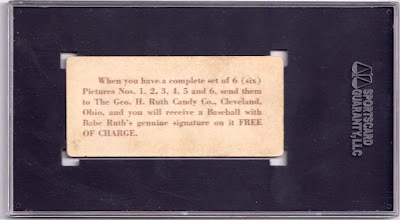 The "real" Ruth Candy wrappers hawked baseballs with Ruth's facsimile signature, given enough wrappers. Since card backs advertised the same prize to kids with complete sets, I wonder how many balls they ended up sending out. Fakes / reprints: People have reprinted and faked these often enough that authentic versions prove hard to come by. I recommend the more attractive 1933 Goudeys if you're looking for a vintage Ruth type card. Here's what I know to watch for regarding faked Ruth cards. Truthfully how do you tell the real cards from the reprints?